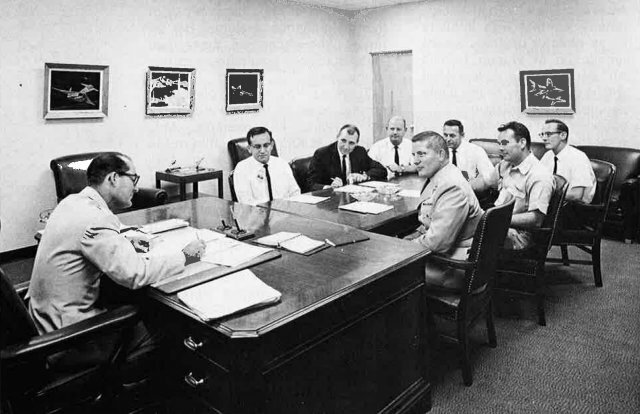 The same book that gave me a scan of the March 16, 1961 story on the establishment of the "missile repair shop" at Heath also gave me this photo. It's from a 1963 meeting of the base's commander and some of his direct reports. The Port Authority took ownership of the Air Force Base facilities in 1996. That ownership transfer included the buildings as well as the furnishings. It included the desks, chairs, and tables too. 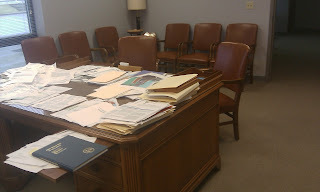 In fact, the transfer included the exact desk and chairs from that 1963 photo. Here they are in my office today. And, yes, I know I have a messy desk. I've written on that before.